This is part of a series of Tech Talks that I write on Sundays. It is meant to provide some background information on the extraction of fossil fuels and metals from underground, both as general education and as a resource when, as with the Gulf oil disaster with the Deepwater Horizon, or with an underground mining disaster such as that at the Upper Big Branch Mine folk need to know what is going on. Thus, for example, at the beginning of the Deepwater Horizon spill, I combined some of these to describe some of the critical parts of creating a well. Today, in that tradition, I am going to be describing how the extraction of coal progressed from manual mining of the coal, with a pick and shovel, to the next stage which was the early use of compressed air power and led into the mechanized mining that we use today. At the end of the last talk I showed the method by which the pattern of mining evolved, with a miner first undercutting the coal, then cutting vertical slots, and breaking out the ribs between to extract the coal in relatively large pieces. Face layout at Houghton (A Pitmans Notebook, The Diary of Edward Smith, 1749). 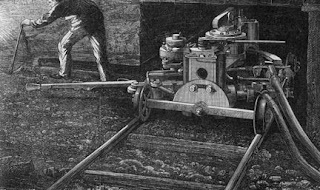 The first step in mechanization was a change from the physical mining of the bulk of the coal, to drilling a hole in the coal face, inserting a stick of explosive, and breaking out the coal more rapidly. The miner then had to do less picking, and more loading of the coal into tubs. 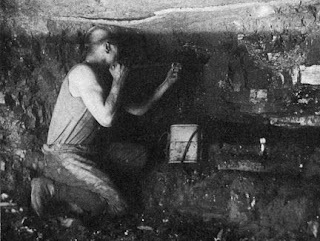 Initially the holes were drilled with a manual drill, with the miner bracing the bit with his body, as he turned it into the coal. The bit was held at the right height using the pinned prop that is shown in the picture. Drills, over time, changed to first compressed air, and then, more recently to electric drills, though these, though more powerful, were heavier and drilling was done without the aid of the prop. The shotfirer was generally the lowest level of administrator in the mine, and had to be certified, after an examination. The explosive was generally moved around in a wooden box, for protection, and fired in later years, with an electrical detonator, to allow a suitable safe distance. Earlier ignition used a burning fuse (as shown in many movies) and this was more hazardous since you could only get a certain distance away after lighting the fuse. 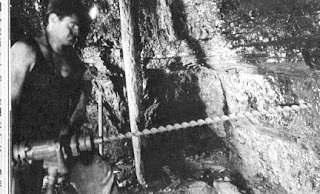 The rod that was used to push the explosive into the hole, and stem the hole (usually with clay or coal dust) to contain the blast, was an initial sign of authority. 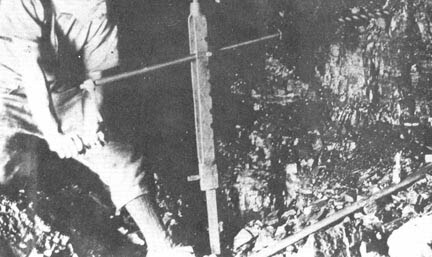 Once the coal was broken into pieces, moving it with a shovel became a lot less work, than physically breaking it from the solid. But before the coal could be blasted down, it still required that it was first undercut to give a free surface to break to. And that was still done manually. Until, that is the invention of the cutter bar. 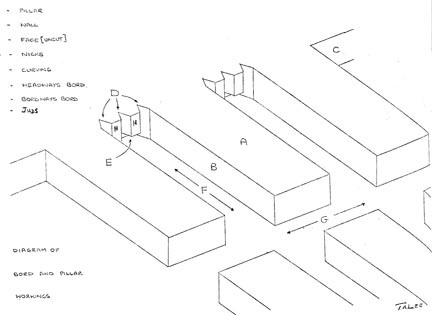 Simplistically the first cutters was a series of small picks mounted into what are known as boxes, along a cutting chain that is itself fed around a long bar that is powered (very similar, on a much larger scale, to the bar of a chain saw). The first of these was developed to help in the driving of the tunnels or rooms, from which the coal was mainly mined. 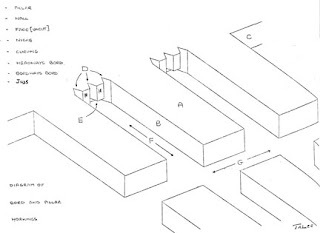 The initial bar could be swung through a 180 degree arc to undercut the coal at the face of the room, as mining advanced. 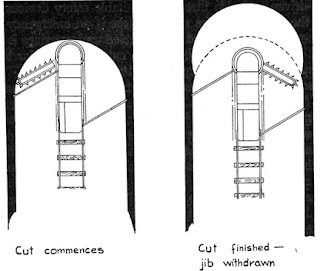 The machines could cut at different heights above the floor, although the base of the seam was much preferred. The earlier machines were manually moved around on rails, which in turn meant that the rails had to keep up with the face. And the early motion was relatively primitive. With a single swing the cutter undercut the working face. 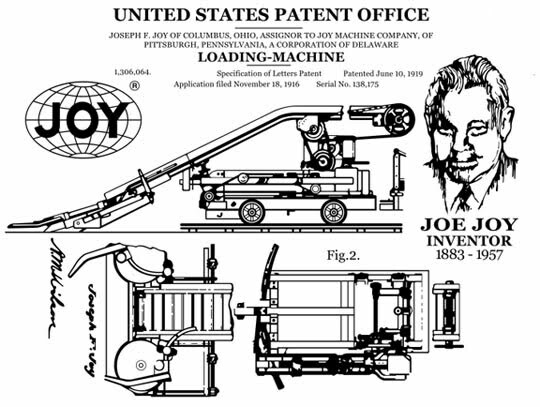 My grandfather, I believe, worked with a variant of this machine. 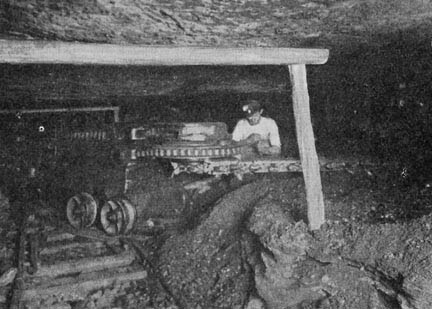 But the last hold-out was to change from manually loading the coal to mechanized motion. After all If the coal was cut with power, and broken with power it made sense that it should also be loaded by power. Again there were a variety of machines that were tried, but then Joe Joy entered the picture with a machine that led into the tools of modern day mining. 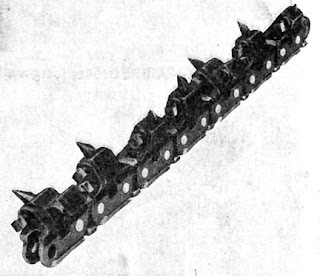 And it is with this image of the Joy Gathering Arm loader (the arms rotate about their pivots to move the coal to the central conveyor) that I will pause, before moving into the modern version of this machine and its offspring. All the components for modern day machines had been invented, it was just a case of putting them together in the right way. Nice blog! Thank you for share amazing information about mining machine. I like all pictures that you display in the blog it’s really help to understand that how the workers worked with old technology and how much afford they put to complete their work.